When planning trips it would be useful to know of other grounds where dogs are not permitted. Apologies if there is a similar thread. Stortford - banned under our licence from the local authority. I can't remember the last time I saw a dog at an away game, so I presume this is pretty standard at our level. Marlow have banned dogs (except assistance dogs) this season. Dogs are welcome at Fareham Town - must be kept on a lead for obvious reasons. I get that further up the ladder dogs are an issue but am surprised at some of names mentioned. Would be interested to know why. As someone who inherited a dog recently, is this idiot dog owners or banned because? I've only taken our dog to one game, Rhayader Town, but she loved it. Good sniffs first half, enjoyed watching the sound of boot on ball second half.enjoyed it. Suspect the lower tier clubs are shutting down a revenue stream here. 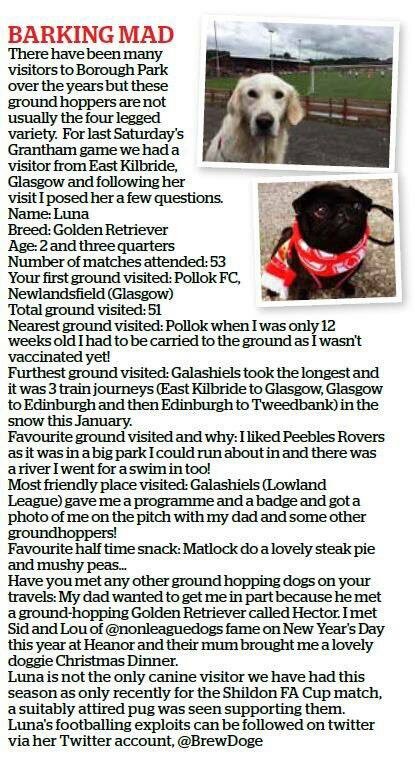 Now and again I meet Luna, the tweeting groundhopping dog, around the Scottish junior grounds. She's managed well over 50 grounds so far (including Iceland). Ironic because they could do with somebody to retrieve the balls when they go out & take two minutes to return to play when the home side is ahead. If that was the pale labrador on the terrace near the entrance, I noticed that was a hearing dog for the deaf, so could still be worth checking with Hampton that they also admit non-assistance dogs. No the one I saw (in the bar, then later behind the far goal) was a basset hound. Funnily enough his friendly greeting in the bar prompted a similar discussion to this one. Dogs are welcome at Stratford Town. Indeed when I visited there was a lovely border collie watching the entire match through a hole in an advertising hoarding. Quite amusing! Maybe a few clues here? More than welcome at Oldland Abbotonians too. We have a pair of sausage dogs, Alex & Sid, who have sponsored the goalkeeper's kit this season and also paid for a page in the programme. Sid is the younger one and a little nervous so he tends to do Saturday games in daylight while Alex, aged 4, is more confident, enough to do evening games. Yes, very friendly. He attends every game apparently and watches the whole game (no, he's not barking mad!). I get that further up the ladder dogs are an issue but am surprised at some of names mentioned. Would be interested to know why..
AFC Wimbledon are going to the dogs.